Back in 2015, Big Buzz published a blog titled The Funnel on the Top of Your Practice, which would go on to become one of our top-read blogs of all time. Because it was so helpful to so many of our 5,000 avid readers, we thought we’d publish a freshened version of it. Imagine that there is a big funnel on the roof of your dental practice. At the bottom is a hole leading through the ceiling and right into your waiting room. Every day, even every hour, new patients flow steadily into the practice through this magical vortex. The marketing funnel is one strategy that Fortune 500 companies and large healthcare organizations use to frame, measure and report on marketing. Here’s how you can do the same. How many people knew about the practice. This includes lapsed patients, people who visited the practice website, those that followed the practice social media pages, total number of online marketing impressions, account of drive-by traffic (the city or county can provide this detail), etc. y trust you and your team. That’s a big if. Educational marketing like content marketing, webinars, podcasts and lunch-and-learn events at the practice can help build that trust and move these folks down to the second part of the funnel. The second set of data, or part of the funnel, represents those patients who may be curious about the practice’s services but need more convincing to actually enter the practice. For stable and mature practices, this is a great place to invest marketing dollars. Nurture marketing tactics include re-engagement email marketing and a website that clearly shows that the practice is available, affable and able. Be sure to include prominently on every page of the practice website: locations, directions and hours; warm and professional photos of the staff; the dentists’ accolades and accomplishments, including awards; patient testimonials and before-and-after photos. Ask your web provider to build your site to be responsive so that potential patients can easily request appointments by calling or messaging directly from their mobile device or tablets. This allows patients to smoothly transition from the nurture section of the funnel to intent. The third set of data, or section of the marketing funnel, is full of patients who are intentional about finding a dentist right now. They are often, or often become, lifetime and even generational patients of the practice. 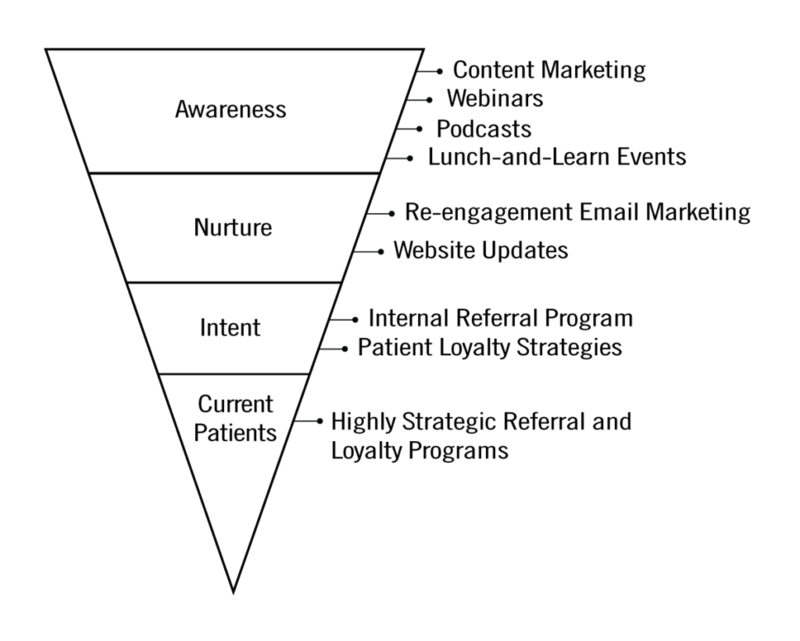 So many dental practices negate this section of the funnel, thinking that marketing starts with awareness and nurture. This is your hidden goldmine! Bottom of the funnel marketing tactics include an internal referral program and patient loyalty strategies. The final set of data shows those patients who are the most valuable to the practice. This is another often-neglected area. These people pack the most power to refer high-quality patients into the practice, if prompted. Again, a big if. The most savvy dental practices deliver highly strategic referral and loyalty programs to these patients in particular, thereby investing less in the other areas of marketing and earning more in terms of cost-per-acquisition. Even more, these patients’ referrals are the crème de la crème of future patients. The magical marketing funnel functions best when all parts are worked simultaneously and consistently. For complimentary recommendations to improve your current marketing funnel, contact us now.